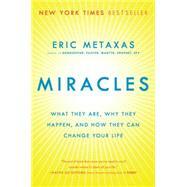 Not since C. S. Lewis in 1947 has an author of Eric Metaxas’s stature undertaken a major exploration of the phenomenon of miracles. In this groundbreaking work, Metaxas examines the compatibility between faith and science and provides well-documented anecdotal evidence of actual miracles. With compellingsometimes electrifyingevidence that there is something real to be reckoned with, Metaxas offers a timely, civil, and thoughtful answer to recent books by Richard Dawkins, Christopher Hitchens, and Sam Harris. Already a New York Times bestseller, Miracles will be welcomed by both believers and skepticswho will find their minds opening to the possibilities. Eric Metaxas is a senior fellow and lecturer-at-large at The King’s College in New York City, where he lives with his wife and daughter.